SUPER HAPPY AWESOME SUMMER GIVEAWAY! What time is it? Giveaway time! We’re getting really excited about Anime Expo, and our Panel (Friday! 10:45 am! LP4! Los Angeles Convention Center Room 411! Be there!) Our flight leaves in less than a week! And how better to share our excitement than to do an Epic Summer Giveaway? We’ve been stockpiling lots of awesome treats and goodies to give away at the panel itself. There will be lots of crazy Japanese Kit Kats, Hi-Chew, Pocky, and all those other treats you love. We’re also bringing some cool Gashapon and toys too! 1. Comment on this entry. That’s it! Just a single comment! 3. Tag yourself in Share this picture from our Facebook Fanpage to your wall, and comment on the picture itself to let us know you did! You can do one, or you can do them all! For each one you do, I’ll put your name in the hat one more time. The winner will be drawn at our panel (and of course, then announced on the blog as well 🙂 Let’s get to it! This entry was posted in Giveaway! 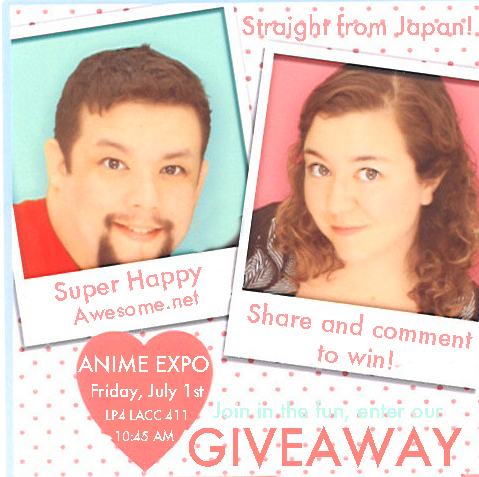 and tagged Anime Expo, AX, AX11, AX2011, giveaway, Panel, SHAFTSA. Bookmark the permalink. 20 Responses to SUPER HAPPY AWESOME SUMMER GIVEAWAY! Ooh, I like giveaways! Let’s do this! I hereby comment that I love giveaways. Please come to the bakery! …I will email! i loveeee japanese kit kats too much hehee. Giveaways FTW! Have an awesome time at Anime Expo. Wish I had the time off to come down to LA to see you. I’m 7 hours from there. =( But if you have time to get away you are more then welcome to come visit Yosemite. *hugs* Have a safe flight…and count me in. I love the giveaway idea 🙂 Gives us a chance to experience firsthand some of the cool things you talk about! Enjoy the HECK outta that expo!! Ex-po-cellent!! I’m a fan of giveaways.